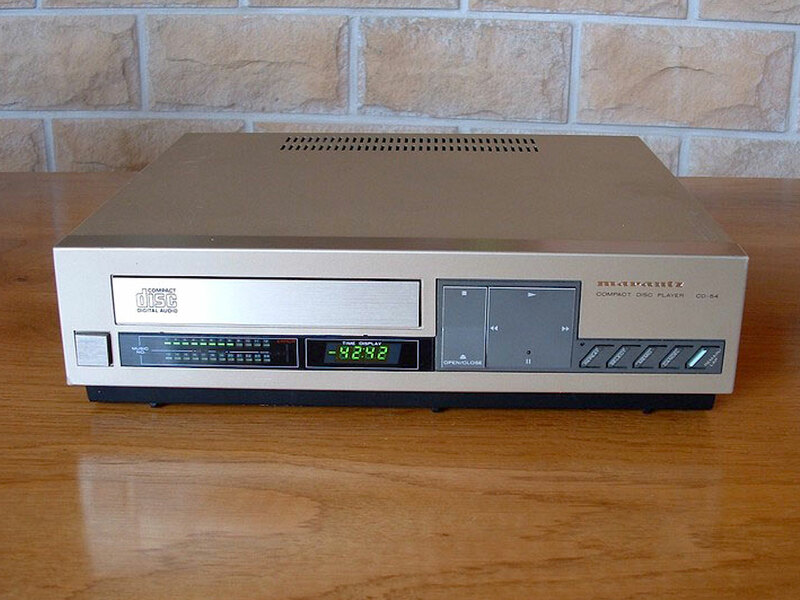 The first Compact Disc players arrived in 1982 and reached British buyers a year later. This generation has since become largely forgotten, which is a shame because – ironically – many sound far more ‘analogue’ than much of today’s high end esoterica. The Marantz CD-54 is a case in point. Made in 1984, it’s a late first generation design using Philips’ exquisite CDM-1 Pro metal diecast transport mechanism and the same company’s Palaeolithic 14-bit, 4 times oversampling DAC/filter package. Despite its midi size, the thing weighs a ton – evidence that the consumer electronics giants built their very first generation players to last. As they the format’s early adopters a packet, it was only right that they weren’t plastic boxes full of air. Anyone who thinks big is better, and more bits and faster oversampling make a superior silver disc spinner, will learn something playing this. It sounds incredibly analogue for something so self-avowedly digital – bass isn’t far off a turntable in its warm and softness, and is barely any tighter either. The midband doesn’t have much in the way of low level detail, but what instruments you do hear have a beautifully rich and sonorous texture. The soundstage isn’t famously deep but is certainly wide and boldly articulated. Treble is the biggest disappointment – what there is sweet and silky, but it sounds rather perfunctory. Interestingly though, it isn’t harsh and painful as you’d expect from its meagre 14-bit DAC. Quite the reverse in fact, it is fluffy and vague and cloudy. The Marantz CD-54 is a surprisingly musical way of listening to digital discs – it’s obviously a long way off the likes of even a good mid-price modern machine in many respects like dynamics and detailing, but is still a hoot to listen to. The fact is that there are lots of machines still going that use this transport/DAC/digital filter combination – from Philips’ original CD-100 to the CD-104B – and all are reasonably priced. If you can live without a remote, programming facilities and S/PDIF digital outputs, then they are well worth searching out. Likewise, those less enamoured with Compact Disc may just find them an acceptable way into the delights of digital disc! The Marantz Cd54 is around 34 years old now. They benefit greatly from a service and having all electrolytic capacitors replaced , bass tightness in particular is excellent once this is done. These early players use two TDA1540 mono dac chips in left right configuration with 4 times oversampling to give a resolution close to 16 bit. Once serviced these first and second gen players sound quality is superb , particularly the ones using the first gen Philips CDM-0 mechanism.